Enjoy an evening of famous Italian opera arias in a spectacular setting with this 70-minute opera concert in Florence's Santa Monaca Church. Listen to professional singers perform selections from 'The Marriage of Figaro,' 'Tosca,' 'The Barber of Seville,' 'Madame Butterfly,' 'La Bohème' and 'La Traviata.' Admire the setting of a 15th-century church. 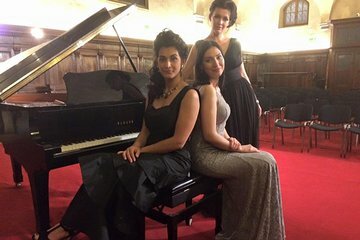 Add some art and culture to your evening in Florence with a 70-minute concert of Italian opera arias inside a 15th-century church. Enter the Santa Monaca Church in the Oltrarno neighborhood of Florence, which dates from the early 1400s but has only been used for performances and exhibits since the 19th century. Having done other concert and evening musical performances in the city, we thought we would try this. Sadly the concert was not very well subscribed, which was a great pity. Only about 30 of us there. Such a shame as it was excellent. The Soprano was superb, and the pianist in a league of his own. The hour whizzed by a drink of wine during short interval. We enjoyed it so much we considered returning the second night but had made other arrangements. Where else can be seated, view works of art, listen to a quality musical performance - and feel blessed at the same time. Florence of course. An ejoyable evening, although a shame that there was such a small audience. A very talented singer and pianist, so the music was lovely. However an introduction and brief explanation of each piece would have been helpful to non Italian speakers. Perhaps an opportunity to buy a glass of wine in the interval would have been good. Totally enjoyable evening. Even my reluctant 12 year old admitted it was beautiful! Unfortunately we did not end up taking this tour. This was an amazing experience! It was a very small venue in a quaint part of Firenze, which added to the event. I would recommend! Although it was only a soprano singer with piano accompaniment they were both excellent and we really enjoyed the evening. The church was a nice venue and within walking distance of our hotel near the train station. Afterwards we stopped for Gelato on our way back to the hotel. I would offer drinks at intermission. Even just wine or prosecco. €5 or similar.